We've all heard the messages: "Aim for the top. You can be whatever you want to be." But being successful isn't just about achieving your personal goals and becoming the best at everything you set your mind to. Whether or not you win the gold medal or climb to the top slot at work, you will only find true success if you are distinctly you, the person God created you to be for His glory. Cheryl Martin shows you how to thrive in your God-given uniqueness rather than becoming fixated on what you are not or do not have. You don't want to waste your life aiming at the bull's-eye on someone else's board, pursuing a race you were never equipped to run. 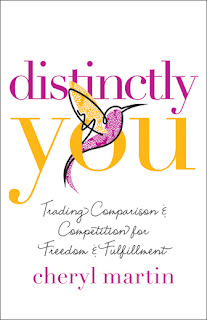 Distinctly You uses Cheryl's personal odyssey and close study of Scripture to unveil the actions and attitudes that both block and build your distinction. Don't be fooled by internal and external doubts--God has prepared you for a unique purpose that only you can accomplish. 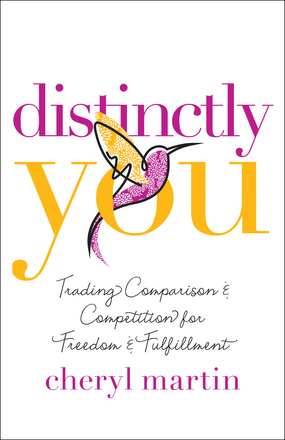 Let this book clear the way for you to become all you were meant to be. Cheryl Martin is an inspirational speaker and host of the weekly radio program Excellent Living. She was a popular news anchor and moderator of Lead Story at the national cable network Black Entertainment Television (BET). Cheryl received a master's degree in broadcast journalism from Northwestern University. She has served on the boards of World Vision USA, ECFA, and Wycliffe. Cheryl lives near Washington, DC. Learn more at www.cherylmartin.org. This book is so motivational and exactly what I needed to read. I think a lot of women feel this way and this book encourages you to be you - distinctly how God made you. I really like that Cheryl encourages us to be who we are and to accept and acknowledge and accept the uniqueness of who we are. We all tend to play the compare game in our society and this even includes the church. We compare who we are to others and then feel bad about ourselves when we don't measure up to what we think we should be. I love that she helps us to stop doing this to ourselves and to love and accept ourselves as God's creation. It's really great at the end of each chapter there are questions for individual or group use. In fact, this book would be great for a small group study. She shares Scripture that enforces how much we mean to God and how He formed us exactly how we are with special talents and skills. I really loved this book. I felt so much more secure about who I am and that my talents and skills are what God gave me and I need to use them. I highly recommend this book and it would be a great encouragement to anyone who reads it.